A magnitude 4.0 earthquake struck west of Molalla, Oregon on Wednesday evening. KGW viewers reported shaking across the metro region. The earthquake struck at 5:24 p.m., about 17 kilometers deep, according to the Pacific Northwest Seismic Network. The epicenter was directly east of Scotts Mills, a town of about 350 people in Marion County. There have been no reports of damage yet. The Marion County Sheriff’s Office said deputies are responding to the Scotts Mills area to check on residents as a precaution. A 4.0 magnitude earthquake is relatively minor, although many people who were indoors felt the shaking. Abreu said he does not expect to see any aftershocks. An earthquake struck in nearly the same spot in 1993. That earthquake was called the “Spring Break quake” and had a magnitude of 5.6. Seriously just had a small earthquake….I think. Anyone else? Oregon? Seismologists expect an earthquake of at least a magnitude of 8.0 to hit the Northwest, with a one in three chance of “the big one” happening in the next 50 years. 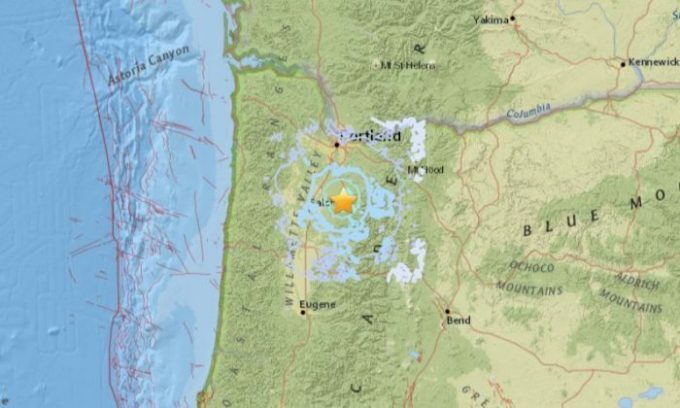 That earthquake is expected to cause widespread damage in Oregon and Washington. Historical records show a magnitude 8.0 or higher earthquake has jolted the Juan de Fuca tectonic plate at the Cascadia subduction zone off the Northwest coast every few hundred years. The last big earthquake is estimated to have struck the Northwest around 1700.